2017 Fringed Fashion has brought back the shimmy-cascading of cocktail dresses and black tie numbers from the roaring ’20s swinging ‘60s and glossy ‘80s, and those who really want to enjoy some time boomerang fun this season must stock up this trend in great abundance. Fringes, when added to hemlines, necklines, bodices and sleeves, give one’s attire a flirtatiously playful effect to drape around one’s curves and create a romantic bohemian aura. Fringed fashion detailing is all the rage, be it clothing staples, handbags, jewellery or outwear options. And we are going to introduce you to the hottest fringed fashion staples spotted on the runways of 2017. This gloriously fringed Alice + Olivia skirt from their fall’17 RTW show has created quite the fashion frenzy, and it is a splendid pick to create a voguishly chic festival attire. 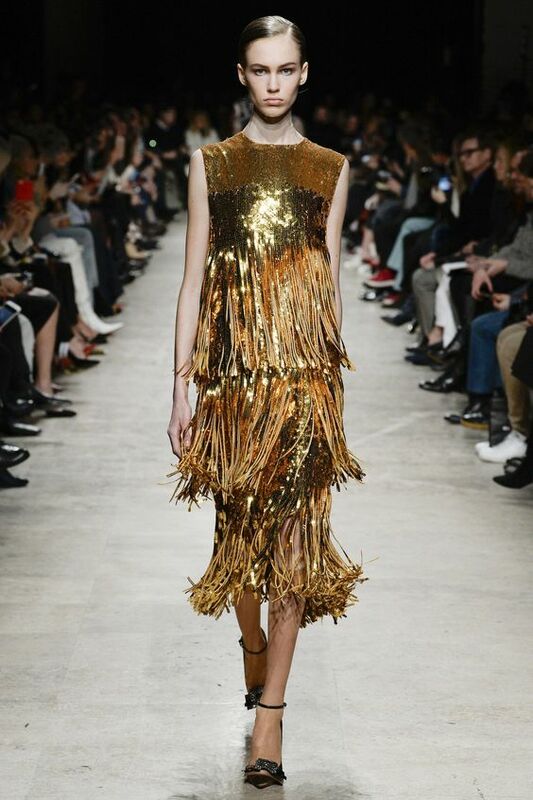 This voguishly chic gilded gold cocktail dress allows you to flaunt two of the raging trends for this season: shiny metallic fabrics and fringed tiers. You can pick it from Rochas fall’17 RTW collection, and flaunt it to all your cocktail hours, club hopping adventures and festive events. 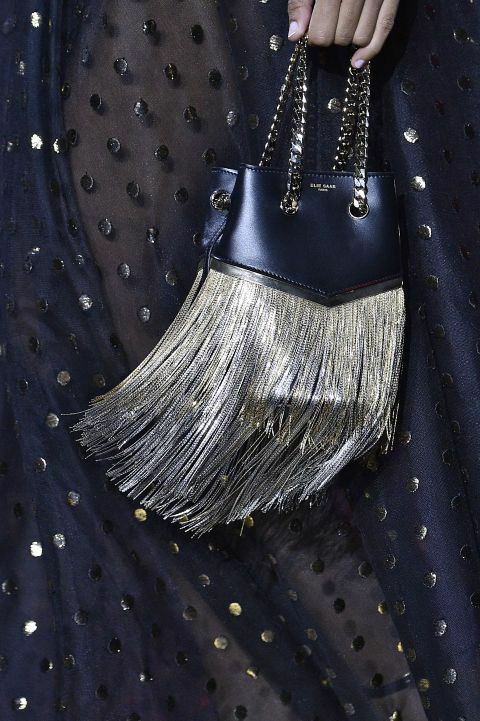 This delicate fringed handbag hit the runway for Elie Saab’s SS’17 show, and its compact beauty was brought to life with its glossy silver fringed detailing. Truly, it’s a wonderfully artsy black tie creation! A contemporary chic Stella McCartney pre fall’17 creation that allows a woman two flaunt not one, but two of the season’s hottest trends: fringes and one-shoulder sleeves. You can flaunt this beauty at festivities, cocktail hours, evening fiestas and black tie events. This gorgeously voguish Erin Fetherston creation from their fall’17 RTW show teaches us that be it the hemline, neckline or sleeves, fringed detailing never disappoints in terms of glamour and chicness. This bold black formal couture number allows a vintage charm and its deeply plunging neckline will help you channel your inner goddess with pride. D&G takes fringed glamour to a whole new level of beauty with these gorgeously fringed heels!